Dead Rising 3 looks great now! Big visual improvement. How many full games is that? I've got Ryse (rental), DR3, Forza 5, Call of Duty Ghosts as well as several digital-only games and the Titanfall beta and I'm only at 41%. Target is offering a $50 gift card this week when you buy an Xbox One. Microcenter also has a coupon on their site for $50 off if you want to go that route. Sooo anyone else starting to think we might see a price drop by E3? Way too early to tell. I doubt it. Maybe a Titanfall bundle or something like that. I don't expect a price drop too soon. By holiday season? Yeah, probably, depending on sales numbers. I'm at almost 25% used, and I thought that seemed like a lot, since most of my games I've bought instead of downloaded. Then I come here and realize it's not much at all. 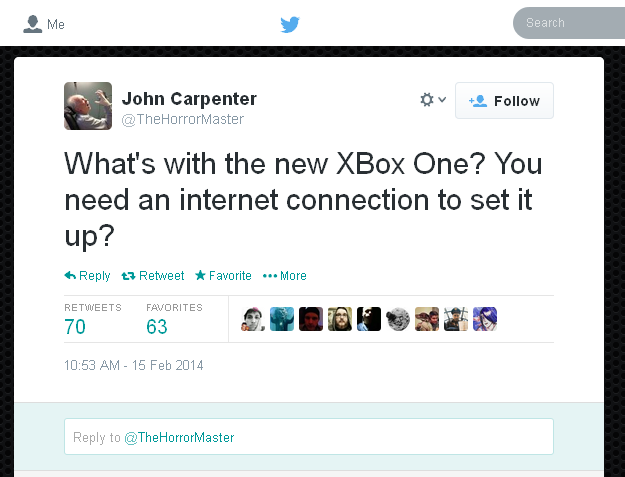 This is clearly going to become an issue once they start actually releasing games for the Xbone. If I'm already at 25% filled with three disc-based games and one download is this system really only capable of offering a maximum of 16 games at a time? Since you have to sit through a long install process for each new game it's not like you can just swap discs in and out on a whim. As a family we easily have 20+ games that get played regularly on the 360. If the Xbone is going to remain so limited in HD space then it's going to have a hard time dethroning the 360. If I'm already at 25% filled with three disc-based games and one download is this system really only capable of offering a maximum of 16 games at a time?. And I'm at 29% with nine games. I guess it's different for everyone, but I'm not worried yet. Ryse will be discounted for a week. 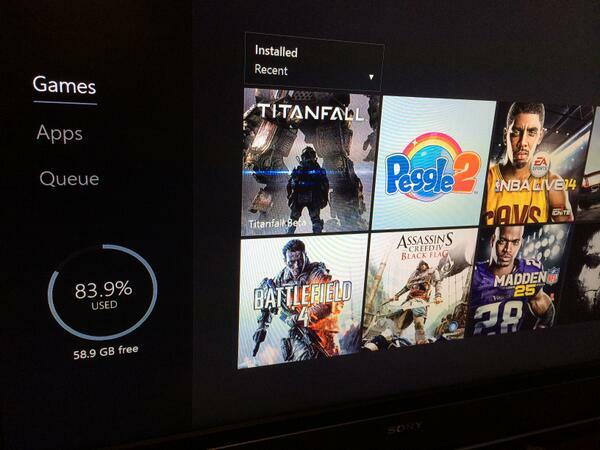 Now I'm 90% sure it will be the first game to be "free"
I still think it might be Dead Rising 3 or Forza 5. Dead Rising3 has higher-priced DLC and Forza 5 has micro-transactions. You know, be like a drug dealer. Give them the first taste for free and have them come back wanting more. Has anyone used Skype yet? Do you have to be wearing the headset/mic to use it? I've been trying to Skype with the family while I'm out of town and the only way I can hear anybody is when they are using the headset. If it's unplugged from the controller they can hear me through the surround speakers but I can't hear them. A home know why kinect isn't picking up their voices? Pretty sure it's gonna be an arcade game like Lococycle. No way would they make a full game free this early on. Now that I remember, I have a complaint. It's something that changed with the Xbox One. I have two controllers. So whenever one is dying I can just turn on the other one and continue playing. That was fine with the Xbox 360. But for some reason they changed that with the Xbox One. Now the controller is linked to your profile, so if the controller dies and I turn on the other one, it doesn't work as with the 360. Here, it says that another profile is logged in with another controller, that I need to login with another account to use this controller. I'm not sure if there's a quick fix for that, maybe some setting, but what I've done is just swap batteries. And yes, I do the same with the PS3, hopefully it will also work in the PS4. Or get the charge and play cable. When you turn on a controller while the PS4 is already on, it asks you which profile is associated with it. I don't have two PS4 controllers so I can't see what happens if I turn one controller off and another on, but I imagine you'd be able to hot swap them. Yes you can. And you'd need to when one dies. Less of an issue with the XO because yeah, you can just swap out the batteries. I just keep a USB cable next to my couch. It's plugged into my wifi router. When my PS4 battery is low I plug in the cable and keep playing. I was having issues yesterday with my controller disconnecting and then reconnecting. My day one controller does it too. It's been doing it off and on since I've had the xbox but I just kind of ignored it until now since it was affecting my Titanfall multiplayer. I had fresh batteries in the controller as of yesterday. Anyone have that issue? Same. Doesn't happen as often now I got a plug and charge battery. This is the first tomei heard of that issue. Titanfall made remember of something else. It seems that we no longer have global inverted y axis setting. That means you set that setting in your console and it works for all games. Yes, I play inverted and that was an awesome feature for me. I've had this issue too... pisses me off as it's usually during a critical MP point in CoD. Oh Dear. You are one of THOSE people! And he is slow too! If you are flying - Then pushing forward = down, pulling back = up.